And now here it is, straight from Southern California. Porsche never built a 993 911 GT3. There was a GT2 though, but the thought of not knowing what a 993 GT3 would have been like was simply unacceptable to Orange County-based Gunther Werks, an extension of Vorsteiner. This is the company most are familiar in relation to production of carbon fiber wheels and body panels. Over the years, however, Vorsteiner has developed the necessary skills to do things in-house, hence the creation of Gunther Werks and the rad 400R. 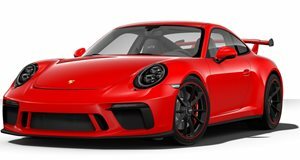 Powered by a 4.0-liter flat-six with 431 hp and 302 lb-ft of torque, the 400R has a reported 352 hp per ton, thus giving it a power-to-weight ratio even better than today’s 991 GT3 RS. The Drive was recently privileged enough to have the chance to get behind the wheel of a 400R before they’re all delivered to owners. And yes, production is insanely limited. Just 25 cars are planned, each one taking between seven and nine months to build, depending on the options the customer chooses. It all starts with, preferably, a 993 Carrera 2, and Gunther Werks strips it down to its bare bones. As you can imagine, something like is anything but cheap. After the paying for the donor 993, the 400R has a starting price tag of $525,000, and this can easily climb to $680,000 when optioned out. We doubt any owners will be complaining the moment they take delivery.